Way back in 2010 we, at Mimi Berlin, had a little business selling our collection of Vintage Fashion Magazines from the attic. We also had a copy of a Vogue UK, the September issue of 1967 with Dutch, then, model Willy van Rooy on the cover (500 grams/â‚¬65,–) Somehow we found out that Ms van Rooy didn’t own a copy of this particular issue and so we sended her ours. We did ask if she could make a picture for us, (see that one above) that she did. We also could pick out some of her jewelry, which Willy van Rooy designs herself and sells in her Etsy store. Now that’s what we call a good, fashionable MimiMagazines swap! When Mimi was a child she walked passed Babe Rainbow more than twenty times a day. This print on tin hung in the stairway of her parental home. Mimi Sr threw it away at some point ” because it was all dented”. 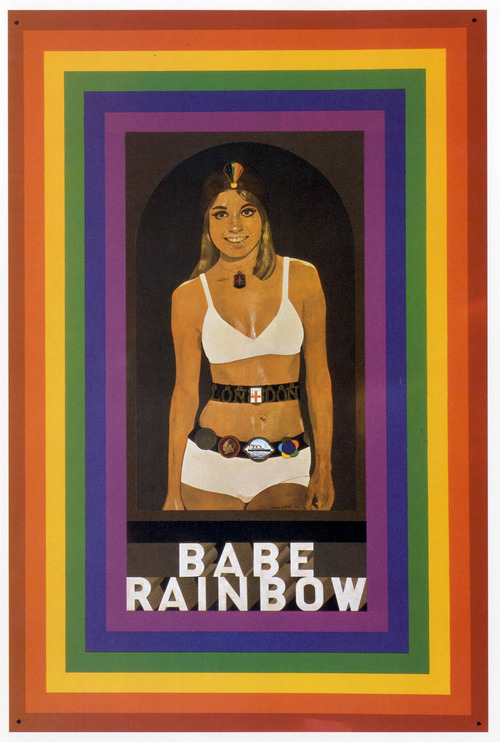 Babe Rainbow by Peter Blake, 1968. (via pallantbookshop) Bobbie Rainbow is the fictional daughter of Babe Rainbow, Bobbie’s father is unknown, but she was born during 1976, when Babe was living and wrestling in New York (for a brief period in 1973 she was the world champion), and her most likely father is Ebony Superman, who was also world champion at that time. Bobbie is wearing the championship belts, and famous leather hat passed on to her by Babe, when she retired from the ring in 1989. She is currently wrestling in the U.S.A. and around the world. Bobbie bears an uncanny resemblance to her mother.